Ambrose Kyte, a wealthy merchant had anonymously offered £1,000 towards mounting a Victorian expedition, providing public subscription raised a further £2,000. A public meeting was held and it was decided to establish a Fund Raising Committee to raise the public money to secure the anonymous offer. At this meeting it was also decided to commission George Landells to sail to India to purchase 24 camels for use in exploring the interior. Although the offer had not been made directly to the Philosophical Institute and the meeting was supposed to be a public meeting and separate to the Philosophical Institute's debates, all members of the Fund Raising Committee were members of the Philosophical Institute and all except one, were also members of the Institute's Exploration Committee. 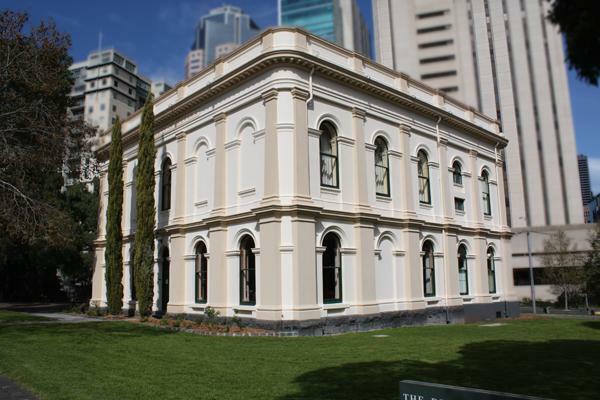 Consequently, the Fund Raising Committee, the Exploration Committee and the Philosophical Institute became an integral part of the Burke and Wills story. 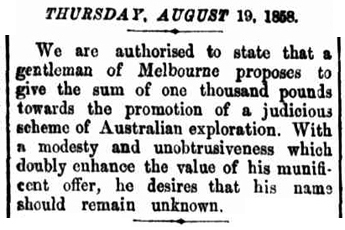 Thursday, 30 August 1860. Page 8. The Philosophical Institute received a Royal Charter on Tuesday 8th November 1859 and became the Royal Society of Victoria (RSV), moving into their new premises at 8 La Trobe Street on Wednesday 21st December 1859. The Society still occupies the premises.